A destination unlike any other in Sydney is opening on 24 September. Darling Quarter is an exciting new eating precinct with a mix of authentic cuisine from around the world. Dining and fresh takeaway options include Meno Diciotto gelataria, Stacks Taverna and Bar from Nick's of Darling Harbour and Sydney's much loved bakery Taste. Adjacent to this 14 strong dining offer is a relaxing open Community Green which will appeal to families, workers, Sydneysiders and tourists alike as well as the biggest children's playground in Sydney's CBD and a multi-purpose children's theatre. Darling Quarter is an exciting new eating destination offering an eclectic mix of dining and fresh takeaway options from authentic Sydney operators including Meno Diciotto gelataria from the Trovato family in Five Dock; Nok of Stir Crazy Thai introduces Nok Nok Thai Garden; Stacks Taverna and Bar, a new Mediterranean grill concept from Nick's of Darling Harbour, designed by Michael McCann who created the look and feel of Sydney restaurant Felix; Sydney veteran bakery Taste and Janus, a boutique Italian wine bar from the Bacco team. Other restaurants include Braza, a Brazilian churrascaria with traditional food and drink offering; Guylian, a chocolate experience; Box and Bowl, a hole in the wall fast fusion Asian takeaway; Umi Sushi, a Tokyo inspired urban sushi diner; gourmet sandwich creators Fat Duck and Son of Tuysuz serving traditional Turkish fare in an intimate kitchen setting. The precinct includes additional amenities such as a boutique news agency, Commonwealth Bank Australia banking facility; and a 600 bay public car par. Lounging will come easy to visitors of Darling Quarter's beautiful Community Green. There will be colourful, oversized picnic rugs plus director and deck chairs, all designed with eco integrity, for people to use. Board games and a table tennis set up will also feature for those taking time out and there will be a series of intimate events hosted on the green throughout the summer months. The new children's playground has over 4,000 square metres of play area and has been thoughtfully designed with huge family appeal. The spectacular large-scale interactive day and night water play features are the first of their kind in Australia and are set to be a major draw card to children of all ages with water pumps, a giant scooping wheel, small water locks, switches and water jets all customised to work together. The additional features in the playground provide physically challenging and exciting interactive play including a nine metre high climbing net, a flying fox, a tandem slide, balancing beams, tunnels and sand diggers. The natural setting of the playground is enhanced with aromatic native plants and palm trees providing natural shade with a playground kiosk and shelter areas for parents and carers. Darling Quarter also boasts a multi-purpose children's theatre and performance facility which will contribute to the family entertaining events of the Darling Harbour precinct. Flanked by the impressive new Commonwealth Bank Place, headquarters to over 6,000 employees, Darling Quarter provides a striking architectural backdrop and visitors will be awe inspired by the array of moving colour in Darling Quarter's modern lighting installation. 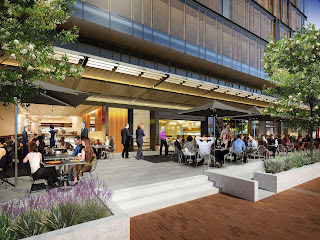 Located at the southern, tranquil corner of Darling Harbour, Darling Quarter is a stunning, new community precinct in the heart of Sydney's CBD. This world class development from Lend Lease is a true example of social sustainability, regenerating a local area for Sydneysiders and tourists to enjoy day and night.